The convict was also sentenced to death for robbing Olaniyi of two rolls of peak milk in sachets, valued at N400. The prosecution counsel, Mr G. D. Fwonyon, who is the deputy director, Public Prosecution in Plateau State had told the court that John, in company with an accomplice, also named John, now at large, robbed the woman on November 18, 2005 in her shop at Gada Biu, Jos at gunpoint. 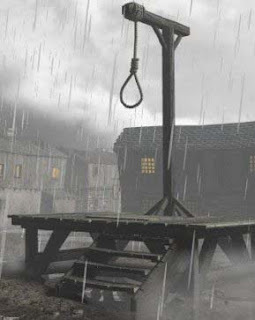 He told the court that John and his accomplice, having allegedly conspired and used a gun to rob Olaniyi, had committed a criminal offence punishable by hanging. But John’s counsel, Mr. Tobechukwu Kekemeke, rejected the prosecutor’s claim, and accused the police of “not telling the truth about the gun” said to have been used by John. Kekemeke pointed out that the police presented three statements, with only the last indicating a confession by the accused that he used a gun against the victim. The defence counsel further argued that the prosecution had failed to prove to the court that the accused actually used a gun to commit the act. In a 60-page judgment, Justice Yargata Nimpa said the evidence before the court had shown that the accused committed the offence and sentenced John to death by hanging. Kekemeke told the News Agency of Nigeria that he would appeal against the verdict. “The convict has the right to appeal against the judgment. It is not a judgment that we are satisfied with, so we are definitely going to appeal at the Court of Appeal,” he vowed.